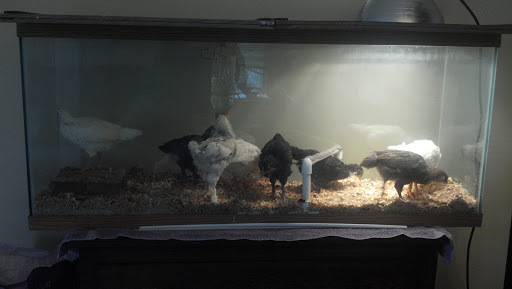 Our eight 4 week old chicks are quickly outgrowing the 60 gallon brooder in our living room. In the past, the most we've kept in it is six and they were able to stay in it until they were ready to live outside full time at about 6 weeks or so. Of course helping this was the fact that we were raising them in the spring and therefore could 1) let them play outside for several hours a day until then and 2) it was warm enough outside by the time they were 6 weeks old for them to safely live out there at that point (with a heat light as needed). This year however, we don't have either of those luxuries with this batch even though we've had an eerily mild winter. Therefore we will soon need to bring in the other tank and divide the chicks between two brooders. I love having baby chicks around but I have to be honest... After a few weeks of incredible chick dust covering everything no matter how much I clean, I'm counting down the days til I can kick them out of the house and enjoy them outside where they belong. I feel your pain trying to keep the house clean! That is one thing I hate about raising chicks. It's amazing how much dust they generate, isn't it?